1970s phenomenon Tony Orlando made a name for himself churning out bubble-gum pop songs with a female duo called Dawn, performing such runaway hits as Knock Three Times and Tie A Yellow Ribbon 'Round the Old Oak Tree. The group sold nearly 30 million records, topped the Billboard charts three times, and had their own television variety show that lasted for two seasons. Orlando has teamed up with Israeli singer Dudu Fisher and they have been performing in Fisher's show The Voice of Broadway, which played in Branson, Missouri and was shown in a PBS television special. A highlight of their show is their singing Hava Nagila followed by Tie a Yellow Ribbon, the song that made Tony Orlando and Dawn famous. Orlando sings the song in English, and Fisher joins in with a Hebrew translation. 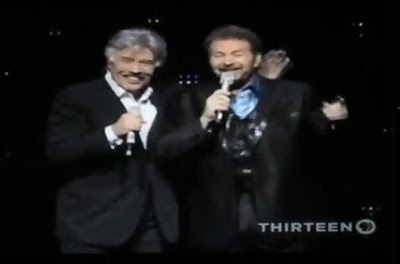 Here's the video clip of Orlando and Fisher singing the two songs. If you're feeling nostalgic about the 1973 original, the Tony Orlando and Dawn original song follows. Absolutely delightful. Thanks for the old memory and creating new a one.